One of a dozen suspects in the death of a 15-year-old boy killed in a caught-on-camera machete attack outside a Bronx bodega last month has waived extradition from Connecticut. 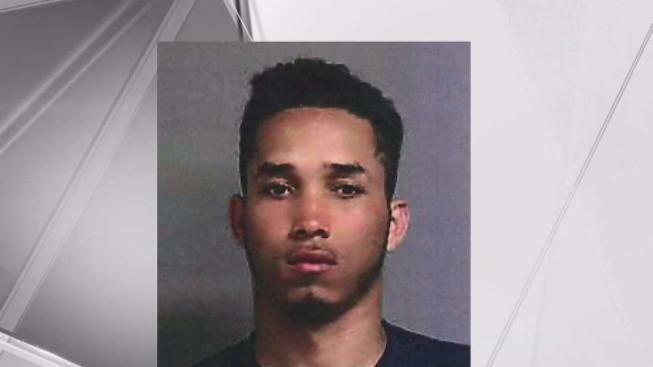 Luis Cabrarasantos, 25, told a judge Tuesday that he was innocent, according to the Republican-American, before agreeing not to fight a return to New York, where he faces murder and other charges in the June 20 death of Lesandro Guzman-Feliz in the Bronx. The boy was slashed in the neck with a machete in what authorities think was a case of mistaken identity. He is the latest suspect to be arrested in the death of Guzman-Feliz, was dragged outside a Bronx bodega and set upon by a gang of men who hacked at him as he struggled to defend himself. The boy was slashed in the neck and died after running to a hospital three blocks away. Two more suspects have been arrested in connection with the machete killing of 15-year-old Lesandro 'Junior' Guzman-Feliz. Michael George reports. The owner of a bodega said that he had tried to protect Guzman-Feliz, who attempted to hide behind the counter. He said he called 911 after the gang members dragged him out of the store and stabbed him. Guzman-Feliz had been part of the NYPD's Explorers program, a group for youths interested in a law enforcement career. The New York City Police Foundation announced it planned to set up a scholarship in his name.